The leakage current clamp F62 detects current clamp isolation faults. Besides leakage current measurements this current clamp measures up to 100 A. 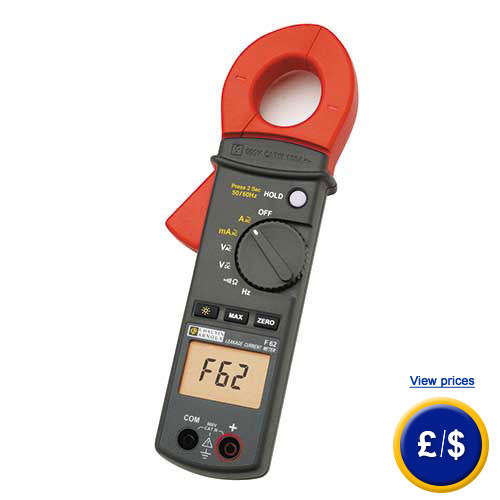 The leakage current clamp F62 is able to measure voltage, resistance and frequency. The display of measured values will be carried out onto a 5 digit display. Besides continuous measurements, maximum results can be stored onto the display. Through a 50 Hz filter, leakage currents can be measured especially for power supply. The display will give an acoustical signal if a leakage is measured. This makes measurement much easier. Machinery breakdowns and therefore cancellation expenses will be prevented. A leakage current clamp is used by professionals in the industrial sector and in machine maintenance. If there are any questions about the leakage current clamp F62 have a look at the technical specification below or call: UK customers +44(0) 23 809 870 30 / US customers +1-410-387-7703. Our technicians and engineers will gladly advise you in all clamp meters and all products in the field of measuring instruments, regulation and control and scales.